So often winter flowering shrubs are big on fragrance but lacking in flower power. The likes of Lonicera x purpusii, Viburnum x bodnantense and Sarcococca confusa are all very well at close quarters, but their small, pale flowers would render them unremarkable if it were not for their potent scent. 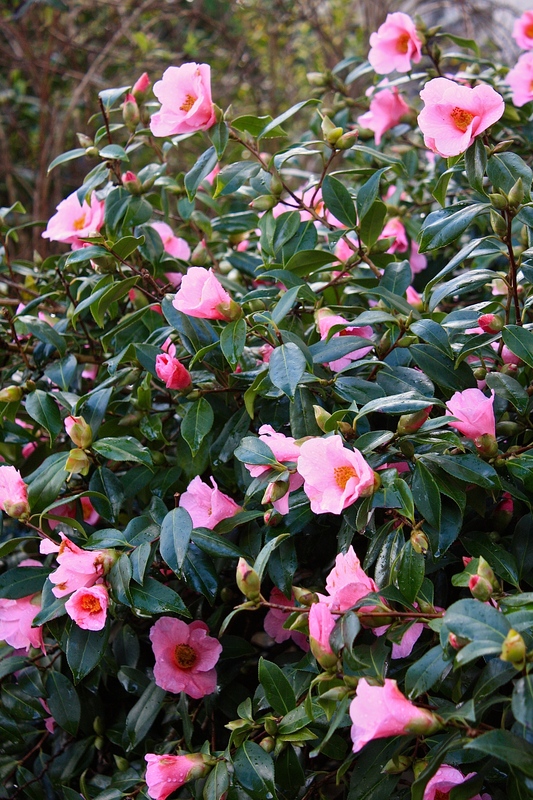 Camellias largely eschew fragrance in favour of dazzling displays of showy blooms. Named varieties, such as single pink C. ‘Cornish Spring’, start the carnival as early as December and are partying hard by the New Year. Windswept and rain-soaked this particular beauty was covered in flowers by the second week of January and will still be going strong come March. ‘Cornish Spring’ needs good light but will grow gracefully in a pot given ericaceous compost and even watering. What can I say, it’s deep winter here…so I just stare at this Cornish image! We have Cornish Snow here, which I love for many reasons. Not close to flowering yet but it is quite shady where it is, perhaps this is the reason? These blooms are amazing. After looking out the window at a cold blanket of snow for several months this color is a welcome sight and encouragement of Spring to come….